That’s a common enough question, if you’re an expectant parent. You might even have wondered it yourself: will you need pink things or blue, and what name will you choose? For generations, it’s been an exciting decision for prospective parents, but Ann Travers asks in The Trans Generation if it’s a prudent one. Maybe letting the child decide would be a better choice. Fifty-six years ago, when Travers was born, their (Travers’ preferred pronoun) mother’s doctor unwittingly caused a lifetime of hurt: “It’s a girl,” he said, and Travers spent years trying to untangle what it meant. That, they said, is part of what drives this book. The other part is the desire to improve the lives of trans kids through understanding. Getting to that point is harrowing: Ninety-five percent of transgender kids in one study felt unsafe in their schools. Many report that physicians misunderstand kids who are gender-nonconforming. Trans kids attempt suicide and/or self-harm at very high rates and, says Travers, “…many grow up hating their bodies….” Most employ several kinds of coping mechanisms to live their lives. In writing this book, Travers says, they interviewed a wide variety of trans kids from the U.S. and Canada—19 in all, ages 4 to 20, plus 23 parents. The children mostly came from middle-class families, which allowed them privileges such as better access to medical care and chances to change schools if they needed to do so. Other children Travers interviewed lived in poverty, their stories illustrating how being a trans kid can be socially and medically isolating, and how lack of access to needed resources can affect their well-being. Parents, of course, can affect that well-being, too. But as Travers notes, it takes a “…phenomenal amount of care, advocacy, and activism…to push back against cisgendered environments,” such as schools, sports, binary-only bathrooms, social activities, medical facilities, and politics. It takes a willingness to learn, listen, and lean in. 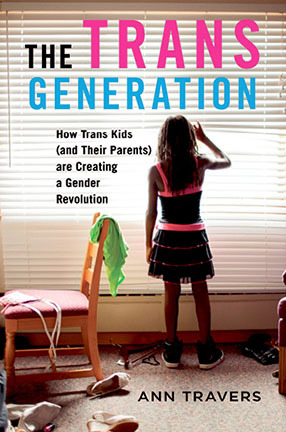 Not just for parents, but for teachers, advocates, and loved ones, The Trans Generation is one heavy-duty book. Writing with a bit of a scholar’s voice and occasional, relatively advanced science and law studies, Travers also offers readers plenty of eye-opening chats with trans kids, which turn out to be the most helpful, useful, and even entertaining parts of this book. From the mouths of babes, as they say, those interviews give insights that adults will find wise and thoughtful, even monumental. They’re also heartbreaking. But considering the kids readers are introduced to, and the singular interview with a 16-year-old who made her own hormone treatments in her high school’s laboratory, they’re a good indication of hope for the future.